Another dodgy start to the day. A car crash meant my route had been blocked not far from my destination, necessitating a U-turn and finding an alternative route. Although this was the back road I was not alone in my plight and a large queue was quickly forming. All however was well-tempered. A kindly man rolled down his window and said “We had better go through Shirwell, follow me”. I’ve never been to Shirwell so I thought why not, something to add to the travel section of my CV. A rather nifty three-point turn later and I was following a soft top Audi up and down lanes perhaps more suited to quad bikes. With those in front and those behind we formed an undulating snake hoping not to meet someone attempting the reverse journey. 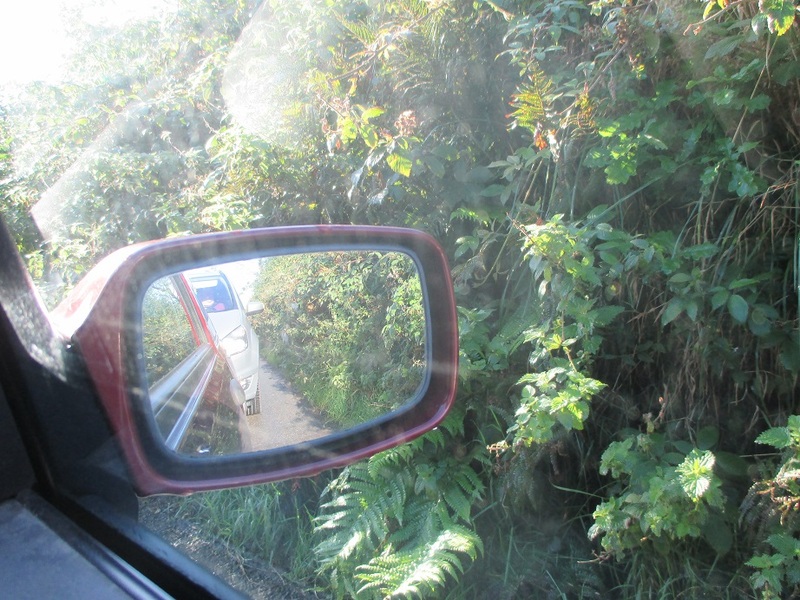 With just enough room for my little car, 2m Devon banks tight on either side, it was like driving down a drainpipe. There were a few ominous pauses, at which point I was amused by The Boomtown Rats playing “Rat Trap” on the radio. After 20 minutes we were back on a mainish road with such modern accoutrements as white lines and lanes, always a bonus in my book. To put your mind at rest, the driver of the turned car was not seriously hurt. Later at Lionel and Lavinia’s all was much calmer and definitely more beautiful. Mauve gladioli, repeat flowering azaleas, shining japanese anemones and most striking, this vibrant lobelia enjoying the welcome sun. Brave girl to follow a strange man into new territory. Glad there were so many others in your predicament as well and glad it all turned well. So a knight in shining Audi helps turn a bad start day in to a better one, I know what you mean about driving down drainpipes in Devon lanes – Mr TT does enjoy navigating, and so glad you got some of yesterday’s sun. Eeeek, yes, the lanes! Glad no-one was hurt and that all turned out well…..intrigued though: I have never heard of repeat flowering Azaleas! Mind you, my Viscosum is so late this year it is out now too but for some exraordinary reason its usual powerful scent is almost negligeable. The weird and wonderful world of gardening,! I haven’t seen them repeat before either, this shrub is almost in full bloom again, it certainly has been a weird season. Have you had a good summer in Germany? Driving down drainpipes doesn’t sound like a lot of fun. 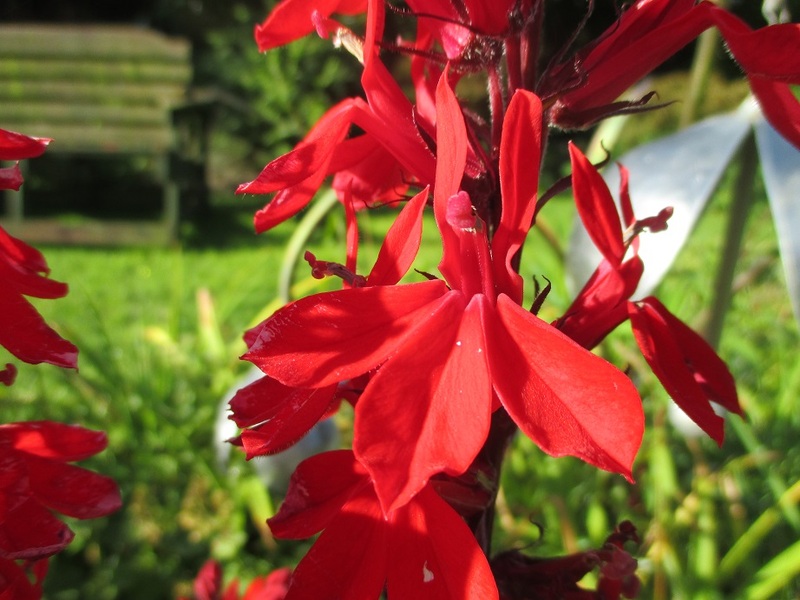 Love the striking complementary red and green of your lobelia photo. Thank you – ever the artist’s eye!